I have the weird habit of really enjoying Business class flights while not wanting to spend all of my money on flight tickets. As of now, I have always been using Google Flights or ITA Matrix to search for Business class connections from my hometown to an airport close to my destination, and then book a cheap economy carrier to my destination, or book a cheap economy carrier to a close country in Europe and then take a business class flight to my destination. ZRH (Zürich, Switzerland) -> PTY (Panama City, Panama) in Business. PTY -> BOG (Bogota, Colombia) in Economy. ZRH (Zürich, Switzerland) -> PRG (Prague, Czech Republic) in Economy. PRG -> HND (Tokyo, Japan) in Business. Is there any search engine that lets you search for this kind of combinations without entering manually all the stopover possibilities? I don't think it's a duplicate, because the linked question is asking for flight options in premium economy when possible, economy when not. I am specifically asking for the possibility to define business for the longer leg, and eco for the shorter, whilst not having to search every stopover destination by hand. There is no easy way to do it. Still, ITA Matrix has very powerful fare search tools that will reduce, though not eliminate, your legwork. +CABIN code1 code2 ...  +CABIN 1    Require booking in the specified cabin classes. -CABIN code1 code2 ...  -CABIN 3    Prohibit booking in the specified cabin classes. Now, as commenters predicted, this itinerary is actually more expensive than simply booking business class all the way through. 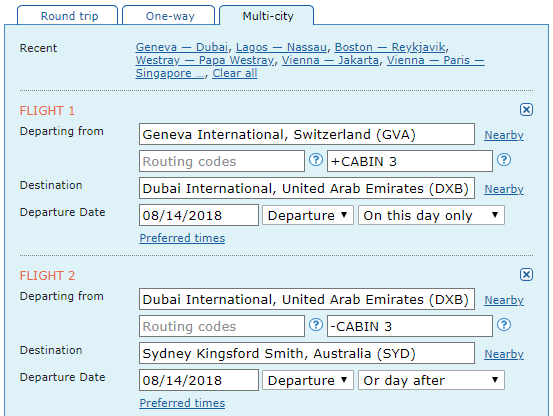 The all-Emirates, all I-fare GVA-DXB-SYD is only 3808 CHF, is much shorter (especially by avoiding an extremely out-of-the-way connection at ICN), and would be on an airline many people would prefer to the others. The principal downside, as you know, is that you would need to re-run this search for every single possible transfer airport, of which there are at least a dozen options, though the choice of connection correlates with the airlines you prefer; no need to check VIE if you don't care for Austrian, for example. And then, once you've finally settled on a reasonable itinerary, you can't book it directly. An airline agent might not be willing or able to find the partner flights, in which case you'd need a travel agent. If you really like the hunt, though, don't let me stop you. You can search not only by cabin, but by fare class, and indeed even by individual fare basis codes. These codes are all explained on the "Faring" tab of the help. F BC=code               F bc=y      Use fares with the specified prime booking code. Note: the actual booking class used may be different due to being overridden by the carrier's booking code exception table. F BC=code|BC=code|...   F bc=y|bc=b Specify that fares use one of several prime booking codes (e.g. book in either Y or B class). See the note on the above item. Not the answer you're looking for? Browse other questions tagged air-travel bookings flight-search-engines or ask your own question. Pricing and booking mixed-class fares, with economy & premium economy combined? When does the 24 hour layover rule apply? Two connecting flights, one in business and one in economy. Which baggage allowance applies?